Look, Listen, Learn and Be Aware! Fire Can Happen Anywhere!! 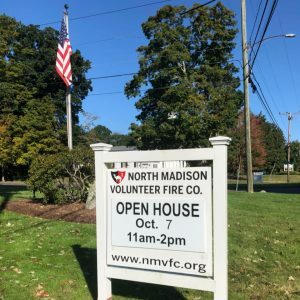 North Madison Volunteer Fire Company invites you to join us for our annual “Open House” scheduled for Sunday, October 7, from 11:00 AM to 2:00 PM. Last year NOMAD responded to nearly 400 calls for assistance, many of them involving a fire related incident. Education is the strongest tool we have to reduce and prevent fires. Even with the best efforts, incidents still occur. This year at our “Open House” we will provide training on the proper use of fire extinguishers, tours of the fire station and apparatus to include our new fire engine edition. Children will have the opportunity to put on real firefighter gear and respond to the midnight alarm. There will be a live fire extinguishing demonstration, rides on our antique fire truck, and refreshments. We appreciate the ongoing support of the community and look forward to seeing you on October 7.